Numerous rockers have had a go at The Simpsons theme song - Sonic Youth, Green Day, to name a few - but it's only fitting that Fall Out Boy finally got their chance: After all, they owe their name to the show. "This is something we grew up with," guitarist Joe Trohman says in an behind-the-scenes video (see it below). It was ahead of its time." 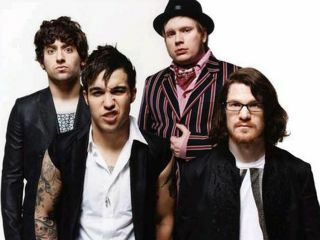 "It was groundbreaking and very cool," says singer-guitarist Patrick Stump. "I know for me, my sense of humor and the way I perceive humor and the way I perceive a lot of things was based on growing up and watching The Simpsons, so to be a part of this for me is legendary." As for how the band approached the iconic piece of music, Stump says simply, "We tried to stay in our zones rather than to force ourselves on it in any way." True to Stump's words, Fall Out Boy don't alter the tune in any noticeable way - to do so would border on blasphemy of the highest order - but they bring the metal. Hard-charging guitars leap out of the mix, and almost Queen-style multi-tracked vocal harmonies magically transport you to the fictional town of Springfield. While the band does, in fact, derive their name from the sidekick of the series' Schwarzenegger-esque comic book hero Radioactive Man, they didn't actually think of it. Nameless for a couple of shows, they called out to audience members for ideas. One audience member shouted, "Fall Out Boy!" If you want to hear Fall Out Boy's grand take on the Simpsons theme song, check out the FOX website.